Today was probably one of the best days in my life! Today I graduated from the Informatics & Communication Academy, HAN University of Applied Sciences in The Netherlands. My college supervisor had prepared a speech and a small gift during the ceremony. ".. even when he was hospitalized in Indonesia, he still pulled through to finish his graduation project. (...) I thought; why did this young man graduate in IT business? He's perfectly suited as a crisis manager." Although it's uncommon to wear a graduation gown and cap at universities of applied sciences in Holland, we still got the opportunity to do so. Luckily my mom was there to film the show and my best friend Jantine took pictures. There were some drinks and snacks afterwards. Finishing my study has granted me the title of engineer (ing.) 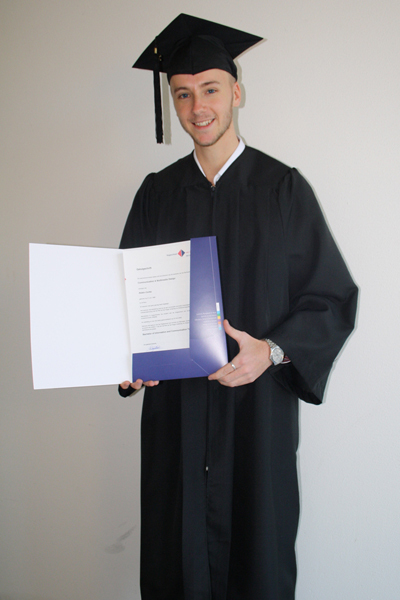 and the degree of Bachelor of Information and Communication Technology. I'm very happy and proud to have to ability to apply my new title. And I just realized that I have spent two years in Indonesia during my bachelor, which is a four year period where students usually spend living in The Netherlands. It was very neat to do my internship and graduation project abroad and even having my minor at the University of Indonesia. These are times I won't forget. That's why I also decided to migrate to Indonesia this year.